We had a most excellent day when we went to visit Hearing Dogs for Deaf People at The Beatrice Wright Centre in York. 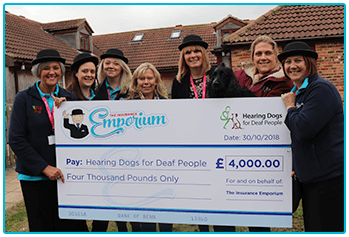 At The Insurance Emporium, we’re so impressed with everything they do that we decided to venture over and present Hearing Dogs with a £4,000 donation to help support their fantastic hard work. This noble charity trains dogs to alert deaf people to sounds that they otherwise wouldn’t be aware of. These could include everyday noises such as a doorbell ringing, an alarm clock going off or a text message arriving. A hearing dog could also help with more serious sounds, such as that of a fire alarm or a crying baby. Our £4,000 donation to Hearing Dogs will go towards the cost of training the charity’s puppies, preparing them for the incredible and life-changing work that they’ll be doing. After being trained by the charity, when they’re ready, the dogs will move in with a deaf person. We’re pleased to donate to such a worthy cause and proud to be working with such an important charity! Once our team had presented the cheque, they were taken on a tour around The Beatrice Wright Centre. While on their adventures around the centre, they got to meet a number of the dogs that were training that day. It was an eye-opening experience that showed just how much work goes into training a puppy, preparing them to devote their lives to helping a future companion. 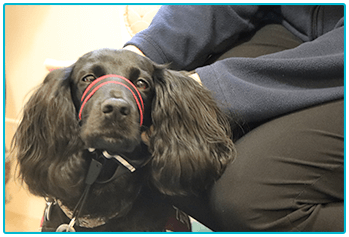 Chief Executive Officer of The Insurance Emporium, Francis Martin, said: “As providers of pet insurance, The Insurance Emporium are proud to be supporting Hearing Dogs, thus helping deaf people reconnect with life. 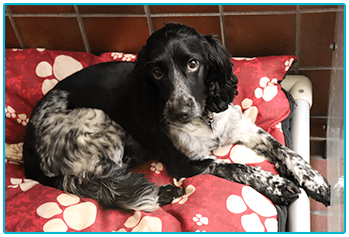 Hearing Dogs are known to increase independence and confidence and, like all dogs, also provide great companionship. It was a truly fantastic day at Hearing Dogs for Deaf People’s The Beatrice Wright Centre and we are so honoured to work with this charity, who do such important work. As they’re a charity that works with dogs, they fit with our ideals of getting the best for our canines – in our case, we do this with our dog insurance. If you choose to insure with us, you could get up to 30% discount* on your dog insurance. What’s more, there are five types to choose from, so that you could get insurance to suit you and your pup. Visit The Insurance Emporium today to find out more! *The 30% discount is available on lunar and calendar monthly policies and policies where the premium is paid annually. It is made up of 20% Introductory Discount plus 10% Multi-pet Discount (if appropriate). The Introductory Discount is available for the first 12 premium payments on lunar and calendar monthly policies or one premium payment on annual policies.